Tomorrow is the deadline for transgender members of the military to get an official diagnosis of gender dysphoria. Anyone who doesn't make the deadline will have to serve under the gender he or she was assigned at birth or leave the military. Since President Trump first tweeted the trans military ban back in July 2017, we have heard from analysts and government officials. SARAH SANDERS: ...That it erodes military readiness and unit cohesion. CHANG: We've heard from trans service members and trans recruits. NICOLAS TALBOTT: ...Sort of thing. But my purpose is to put on that uniform and do my job and serve my country. CHANG: Well, today, we're going to hear from a family. CHANG: You talk right in here. CHANG: That's Livy (ph). She's 6. She and her 10-year-old sister, Kathryn, were checking out some microphones in the studio here at NPR. KATHRYN: It sounds so weird. Their parents are B and Peg Fram. 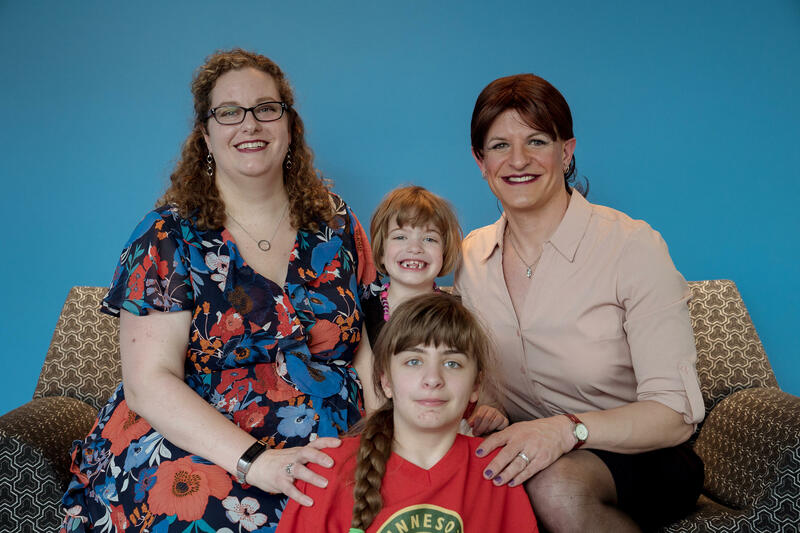 They live in Ithaca, N.Y., but the family came to Washington, D.C., this week so we could talk to lawmakers about this deadline for trans service members. LIEUTENANT COLONEL B FRAM: I have an email from the Air Force saying exempt from the policy as it currently exists. CHANG: B is trans, in the Air Force and leading cyberspace in warfare operations. B FRAM: I have a couple of different teams working for me to do offensive cyberspace as well as counter drone research. CHANG: B has been married to Peg for 14 years. PEG FRAM: We are the backbone, I really feel, that makes the military member able to do what they can do, when they have someone supporting them, loving them. We do our own type of service as a military family. CHANG: Early on in their relationship, B, who uses they-then pronouns, told Peg about wrestling with their gender identity. B FRAM: I communicated these feelings that I'm in some way different to her within three weeks of us having met. But I didn't know what it meant at the time. So it's been a roller coaster a bit between us in, what does this mean? How does this impact our relationship? CHANG: All of that was going on at home, and it was a secret. B FRAM: You'd have to stop and think, oh, if I say this and it gets in the wrong ear, does it come back to me and I lose my career for something that has absolutely nothing to do with my ability to perform? P FRAM: I used to say I lived an edited life. I had to stop and think and switch pronouns in my head and basically lie sometimes. CHANG: In 2016, that changed. The Obama administration announced transgender people were welcome in the military. They could come out, receive medical care and get treatment covered by their government benefits. B FRAM: The ability to serve openly is an amazing one because you can bring your whole self to work. P FRAM: ...Than B is. So B and me, it was like, all right. Let's do this. P FRAM: Let's go out there. B FRAM: Let's change some hearts and minds. P FRAM: And meanwhile, I'm like, let's chat, and let's help people individually. CHANG: Well, now there's a new administration and a new reality. B is openly trans at work, and the only way they could continue to work, serve and continue to be out was to get an official diagnosis of gender dysphoria. Getting that diagnosis in hand is what allowed B to get that email from the Air Force exempting them from the ban. But the decision to rush and get that diagnosis was not an easy one. B FRAM: Being put on the clock was awful. It's an imperfect analogy, but I like to talk a little bit about being trans as it's kind of like having high cholesterol, where if you reach a certain threshold, you need treatment. Some people don't reach that stage until later, and some people never get there. But I was put on a clock when said, you need to make the decision right now about where you might be in the future. And if you don't make that decision now and you get to that point, you would be forbidden from seeking treatment for it even if your doctor says it's medically necessary care. So that was a brutal feeling to be stuck on the clock. CHANG: Peg, what about you? I mean, what has it been like trying to meet this April 12 deadline for you personally? P FRAM: Short answer, it hasn't been easy. We've struggled throughout our entire relationship with how far is comfortable for us right now? Is going out on dates comfortable for us or not? And it's kind of a give-and-take. And then to have someone else tell me, no, no. You need to accept this. Everything in me fought against that because I just wanted to say, no, you don't get to tell me what I get to do. I have my own journey in dealing with - I met Bryan. I fell in love with Bryan. I married Bryan. We had kids. We moved on, and B has come into our lives. But it is almost like bringing a new person in. P FRAM: It challenges everything from my sexuality to my femininity, and that is a hard thing for me to deal with, let alone to have someone come up and say, deal with it faster. CHANG: Right. It is official now, right? CHANG: This is on a piece of paper. How does seeing that piece of paper or that email make you feel, Peg? P FRAM: I'm still scared. P FRAM: I'm scared that now it's easier for someone to come through later on and change the policy and say, we've called you out. We have this piece of paper that says that you have gender dysphoria, and we don't like that. So anybody with that in their record is now gone - not saying that they will, but it opened up another avenue of fear for me. CHANG: Do you share those fears, B? B FRAM: Not that specific fear, but what held me back for the longest time from getting the diagnosis is you must have clinically significant distress. And the thought of going to someone saying, you're clinically distressed and in some way incapable of doing something was really painful 'cause it never affected my ability to do my job in any way. But having that on a medical record is still scary. CHANG: What about your kids? How are they absorbing this? B FRAM: We haven't shared anything medically with the kids. To the kids, it's just business as usual. P FRAM: Because this is what they've known for the majority of their lives, and they've learned to accept that and integrate it into their lives. It's not so easy for people on the outside who haven't lived this. CHANG: Yeah. Peg, you know, you were saying how you're the more private one. You're not the one who's going to put yourself out there and be out there. But you're out here in Washington, talking to lawmakers. You're here sitting in front of me on mic. In a way, has this deadline given you the ability to own it? P FRAM: It has. I'm standing here saying to everyone, listen, B is our primary breadwinner. I gave up my career accepting that we were going to be part of the military for 20, 30 years. I want people to understand that the spouses, the children, all of us are here and being massively affected by this ban. And if that means that I come out, and I'm the one who stands up and is able to talk about it, then I will step forward. And I will do it because I think it is so important. CHANG: B, I'm sure there are a lot of people listening who would say, if you're so upset about this deadline and the pressure that you've been placed under, why don't you just leave the military? B FRAM: I have so much invested in the military. The reasons I joined haven't changed. I joined because I want to serve my country, and I want to keep our men and women around the world safe. And that's what I've done through my entire career in the development of technologies and capabilities that watch over us. I joined right after September 11, and that had a profound impact on me and my ability to give back. The military is where I found a home. It's where I found a family. It's where I found purpose, and I want to remain a part of that. CHANG: Lieutenant Colonel Bryan Bree Fram and Peg Fram, thank you both for coming in and spending the time to talk to us today. P FRAM: Thank you so much for letting us be here. B FRAM: It's been a pleasure. (SOUNDBITE OF JOHAN AGEBJORN'S "8THS (INTRO EDIT)") Transcript provided by NPR, Copyright NPR. The Supreme Court has reinstated President Trump's order placing restrictions on transgender persons enlisting and serving in the military by granting a stay of two lower court injunctions that had blocked the president's policy. 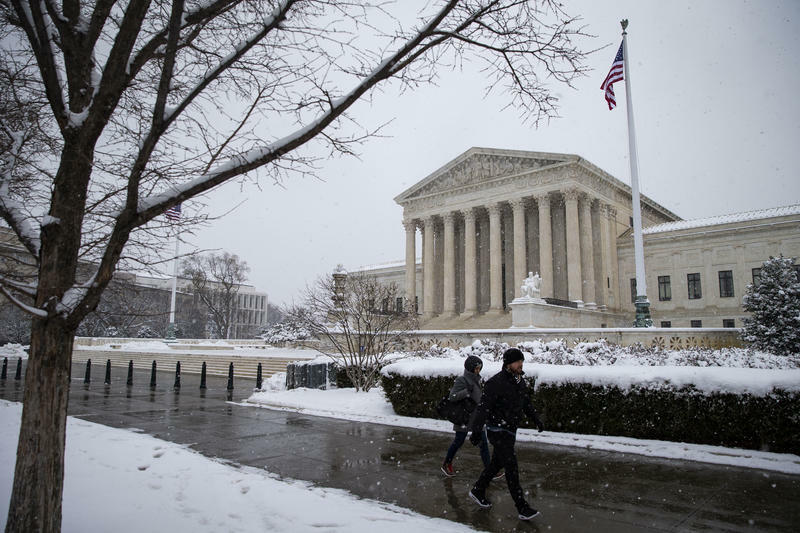 The justices voted 5-4, reflecting the high court's conservative majority.